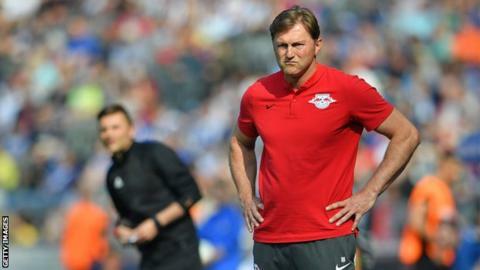 Former RB Leipzig boss Ralph Hasenhuttl has been appointed Southampton manager on a two-and-a-half-year deal. Southampton sacked Mark Hughes on Monday, eight months after he took charge of Saints, who are 18th in the Premier League table. The former Ingolstadt manager guided Leipzig to sixth in the German top flight last season but left after failing to agree a contract extension. He will officially take over on Thursday, with first-team assistant coach Kelvin Davis taking charge for Wednesday’s game against Tottenham at Wembley. “As a coach, he embodies the passion, structure, communication skillset, work ethic and appetite for growth we strive for in our Southampton way. His time at Ingolstadt is probably more relevant to Southampton fans because he took over a club when they were on the bottom of the second division and he managed to keep them up and take them into the Bundesliga. His English is good and I think he’s precisely the right man for this job. In Germany he has the reputation as being one of the best coaches in the Bundesliga. He built that up over the past three years at Leipzig, working very effectively with Naby Keita for example. With Pascal Gross at Ingolstadt – he very much made him the player he is today as well. So all the signs are that he has all the tools, particularly from a man-management perspective. The sort of football that he wants to play will be very much suited to the Premier League. It’s all-action, high-pressing – almost anti-Pep Guardiola, is how I’ve seen it described as before. When he came to Ingolstadt it was a very tough challenge. We were in the relegation zone after only winning one game in the first 10 of the season, so nearly the same situation as in Southampton. He’s very good at putting the whole club back on track. In this situation it is very important to work in the same direction – not only the team, not only the players, I include the board and the fans. He’s good at combining all those parts to get one powerful club. He’s the guy that likes to make jokes before training, not during. He shows you that you have to have passion while playing, that you have to love what you are doing and he shows the players how it is and he expects them to follow him. He’s very similar to Jurgen Klopp in a few ways but he’s more than a copy of him. He’s very animated, passionate, but it is his way of coaching. I’m pretty sure [he can keep them up]. It’s more like a project, it’s the start of a better time for Southampton but it also depends on how much time he will get.